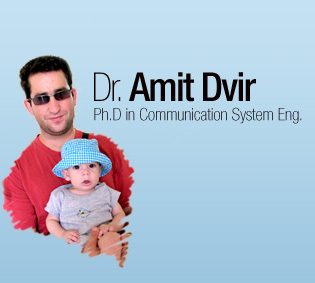 My name is Amit Dvir, Ph.D. in Communication Systems Engineering, from Ben-Gurion University under supervision of Prof. Michael Segal. Post Doc in CrySyS lab (www.crysys.hu, discvered recently the Duqu malware), Department of Telecommunications of Budapest University of Technology and Economics in Hungary. Sponsored by EU FP7, Marie Curie action- Mobility grant and supervision of Dr. Levente Buttyan. My research lies at the intersection of systems and theory. I am motivated by problems presented by real life. My goal is to explore the properties of those systems and develop real life algorithms. I am intrigued by communication network systems, such as wireless sensor networks, ad hoc systems, intelligent transportation systems, and low-power and lossy networks. I believe in a multidisciplinary research approach; in particular, I have been using tools and results from mathematics, graph theory, computer science and communication system. I stand for team work and enjoy the enrichment of collaboration, both within my field and between fields. I am a self-taught hard working person, one who is not intimidated by new challenges.